Last week Volvo held a press conference ahead of the forthcoming Euro Bus Expo exhibition to provide an update on their plans and recent developments, though I understand that they anticipate making further announcements during the show. The company recognises the increased technical requirements of Euro6 and is concentrating on providing support for customers over the life of the vehicle with a new slogan, ‘Your partner for the complete journey,’ offering a complete package including vehicles, contracts, support, aftermarket and telematics. Volvo has streamlined its coach range for Euro6 going from four different chassis to just the two, the B8R and the B11R which it offers with coachwork by Plaxton, Caetano, Sunsundegui and Jonckheere as well as the in house built 9700. The B8R features the 7.7-litre D8K engine rated at 280hp, 320hp or 350hp while the D11K has 380hp, 430hp and 460hp rating options. 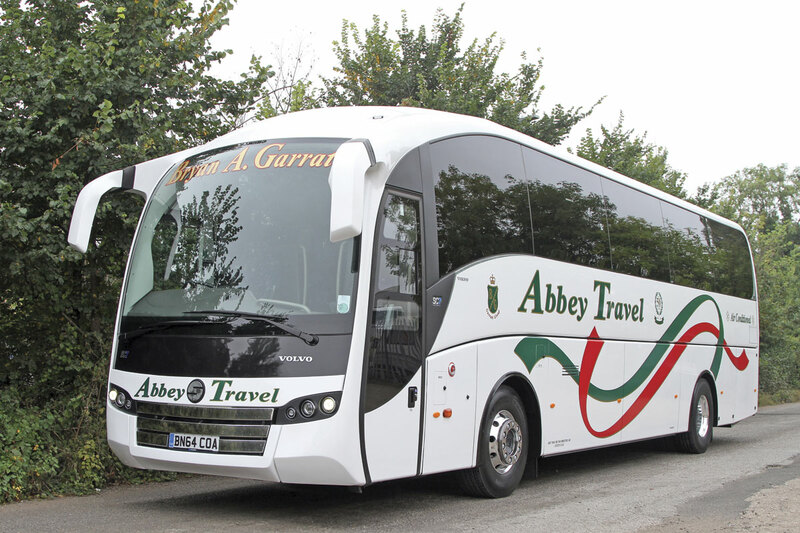 All Euro5 engined new stock has been sold and already 87 Euro6 powered coaches are in operation in the UK and Ireland. Looking at the coach market, Coach Sales Manager, James Hyde, said he believed the trends were fairly positive, though he did not anticipate a return to a market size of 1,000 coaches, though the year to date figure of 766 is ahead of last year at this stage, 2013’s final figure having been 855. He said that Volvo’s share would be over 40% benefiting from growth in the express market. ‘There is a new confidence in the retail market,’ he said, helped by the more ready availability of credit and the need of people who had held off for some years to update. There was also a better position in the Irish market. In addition to all the models introduced at Euro6, Volvo has another new model it will be adding to the range it offers in the shape of the 10.3m Sunsundegui SC5. 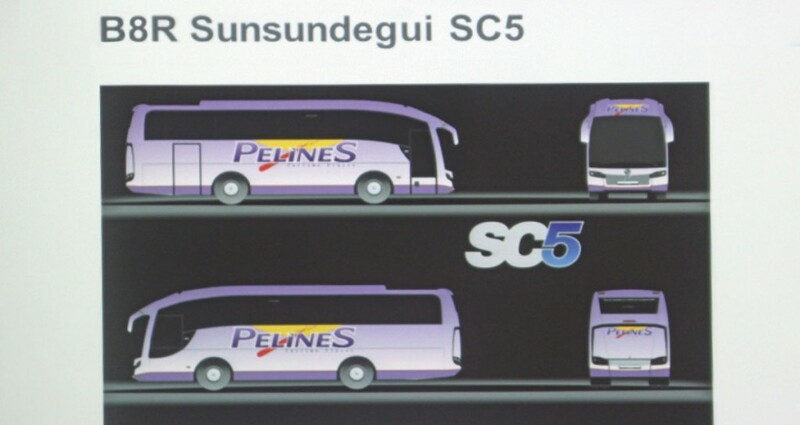 This is a scaled down version of the existing SC7 and will be based on the Volvo B8R chassis. It replaces the Sunsundegui Sideral 10 formerly offered on the B7R chassis, is 3.3m high and will be available with up to 41 seats. Artist’s impressions show a continental door behind the rear axle. Two chassis have been despatched to Spain and a launch is expected in March 2015. After a difficult period, Sunsundegui is continuing to improve its position, aided by signs of recovery in the Spanish market with 2014’s total expected to be 250 units and a prediction for 2015 of 315. From time to time there have been rumours about the long term future for the relationship with VDL Jonckheere and this was answered with the news that the two parties have just agreed a new three year deal. Apparently, the bodybuilding capacity is around 450 annually and over half of this is on Volvo chassis for various markets, some outside Europe. This year has seen a very significant milestone achieved with the delivery of the 2,000th Jonckheere bodied Volvo in the UK, in fact the total is now 2042 ordered or delivered with a further 56 on order for 2014/2015. In the past Jonckheere has supplied coachwork on Volvo’s B58, B10M, B10MA, B12M, B12B, B7R, B9R and B13R chassis and now it is the B11R that the JHV is mounted on. Plaxton was a vital partner for Volvo, accounting for over 160 UK sales in 2014 with the total of chassis supplied to the company being over 200 when orders such as PolskiBus are included. With the Panther 3, Elite and Leopard, operators were placing repeat orders based on quality and performance. Turning to the 9700, bodied at the Wroclaw plant, Volvo has now sold the 150th example of the model in the UK and Ireland. Much was also made of the greatly enhanced fuel economy figures being achieved by the latest generation of coaches, not something Volvos of earlier eras were necessarily renowned for. Managing the used side of the equation is a vital part of coach trading and at times in the past Volvo has had massive stocks of used product. As James explained, ‘When you have two or three hundred used you can’t manage your stock. We’ve steadily worked our way out of that.’ There had been a change of personnel and a change of focus and it was now all about the customer experience. The used operation broke even for the first time in a long time in 2013 and that would be repeated in 2014 when a significant contribution to the business will be made. Ideally stock levels should be at around the 80 mark, the figure the Coventry premises are designed for, though currently the level is only 35. More stock is due in before the year end and many more in the New Year. James said that they were being aggressive, paying more for part exchanges because demand was outstripping supply and they were also happy to do multiple deals. They looked to acquire vehicles between two and ten years old and needed different marques and specifications. On the stand in Birmingham, which will be centrally located within the hall, Volvo will be showing a 9700 coach mounted on the B11R chassis, the new 7900 Euro6 Hybrid in Lothian colours alongside a charging station for a plug-in hybrid, an unbodied B5TL chassis and a Frontline diagnostics van that will be connected up to the chassis. In addition there will be examples of Jonckheere and Sunsundegui SC7 bodied B11R coaches in the demonstration park. Andy Kunze, Aftermarket Director, reported that the Euro6 introduction had gone very well for Volvo. It had seen the electrical architecture evolve from the BEA-2 system used for Euro4 and Euro5 to BEA-3. With the change, Techtool 2 is needed to interrogate the Euro6 systems, rather than the previous Techtool system. Up and down the country Volvo dealers have invested in the equipment and the training to ensure they can support both PCV and truck operators. Volvo has also been investing in its Frontline service, originally introduced in the 1990s, as the presence on the stand of a Frontline van will highlight. This has developed from being a support function for warranty and campaigns to offer operators a complete diagnostics service geared to today’s vehicles. Though it is in place to support Volvo it is capable of handling all makes, coming to your location to do so. Every van will have a Bus Key Technician on board who will be both competent and accredited. Operators will be able to make direct with their local man who will be able to offer help and advice and to invoice directly from his van. Turning to soft products, Andy said that both peace of mind and telematics offers were available. The company was continuing to sell Volvo contracts and to sell and promote genuine Volvo parts. The aim was to try and drive customer satisfaction which was measured and performance continued to improve. All UK vehicles now came with a 12 month telematics package that could be extended on a 12 month subscription basis thereafter. This web based system supplies a customer with secure real time reports. Bus Sales Director, Phil Owen, admitted that 2014 had been a difficult year because there was no cut off date for the supply of Euro5 yet after Volvo had made the conscious decision to move to Euro6 for all new bus deliveries. The original plan for the year had been 640 units and to date 258 Euro6 engined buses had been supplied, 70 of them to Dublin Bus. There had been 132 hybrids supplied of which 121 were Euro6, including 40 single deck 7905H models. There had been 142 pre-built Euro5 engined buses in stock and all but 22 of these had now been sold. For 2015 the target was 595 buses, the reduction reflecting factors such as the market distortions caused by TfL’s new Routemaster orders. The aim was to supply 444 double deckers (including 141 hybrid) and 151 single deck, with all of the big groups including 18-tonne single deckers in their tender requirements. A further target was for 25% of vehicle sales to include a soft product element. At Euro6 there are two Volvo double deck products, the B5TL and the hybrid B5LH, both featuring the four-cylinder D5K engine. Like-for-like comparison between the former B9TL and the B5TL showed that the new model was a tonne lighter, tipping the scales at 10,909kg to TfL specification. Trials at Millbrook revealed that this equated to an 11% fuel saving. Working with bodybuilders, the time required for maintenance had also been reduced by 10%. Other chassis changes include the inclusion of an Oilmaster engine oil top up system as standard, upgraded wire harnesses, and the main engine ECU mounted separate from the engine. Body options on the B5LH are either Wrightbus or ADL at 10.5m or 11.4m, with the MCV offered at 10.5m only. 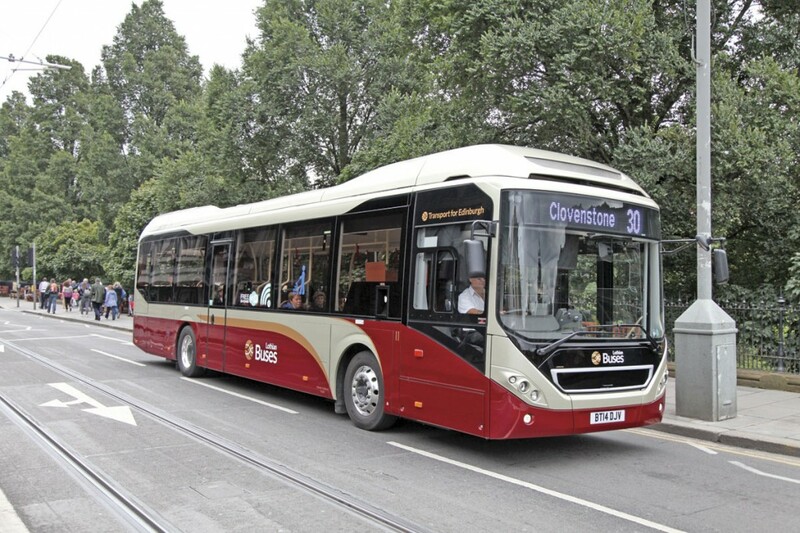 Wrightbus offer both length options on the B5TL, MCV offer a 10.5m B5TL and ADL is to offer options during 2015. He claimed that, though the relationship between Volvo and Wrightbus had changed to satisfy competition law, it remained as strong as ever. 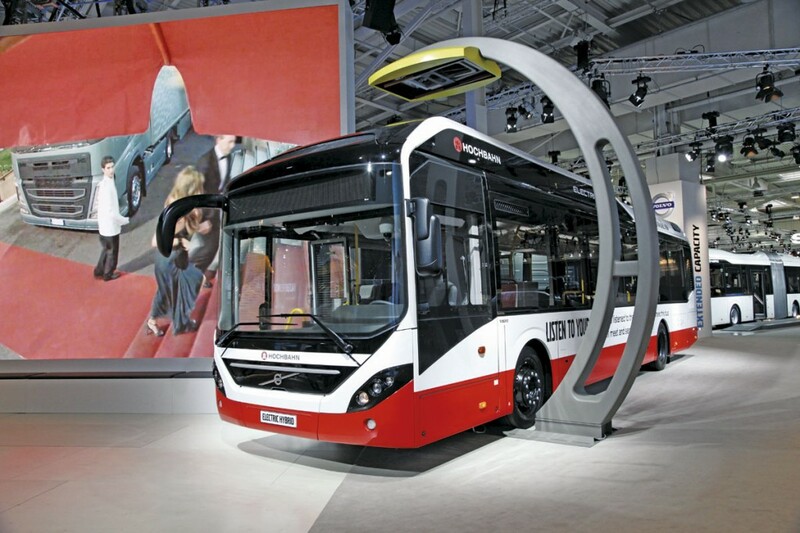 Wrightbus remained the lead bodybuilder for the development of new Volvo products. As revealed in our IAA report, MCV is to launch a new double deck body on the B5TL with the first deliveries expected in June/July 2015. Phil anticipated MCV sales on Volvo of 50-100 during 2015. Phil is very pleased that after a long gap Volvo had won its first bus orders from Stagecoach group. Stagecoach Dundee is to take 18 B5LH hybrids with ADL bodies in June/July 2015, 32 having been supplied to Stagecoach London earlier this year. Other B5LH orders were for Tower Transit (11) and Metroline (14). Single deck options are the B8RLE low entry bus and the completely Volvo built 7900H integral hybrid which is to be joined in 2016 by the fully electric 7900 plug-in hybrid that was launched in left hand drive at the recent IAA exhibition in Hanover. Volvo claim that, compared with a Euro5 diesel it achieves fuel saving and emission reductions of 75% and can operate for 7km in emission free mode. It relies on opportunity charging en route or at a terminus. Replacing the B7RLE, the B8RLE is initially to be offered with bodywork by Wrights and MCV with a new ADL option coming during 2015. It is 12.1m long and powered by the six-cylinder D8K engine delivering 280hp and peak torque of 1,040Nm at 950-1,700rpm. It has the ZF Ecolife 6AO1200B transmission. Two demonstrators are being built. An MCV bodied example is to go on long term demonstration with Arriva at the end of October and a Wright bodied example is to be demonstrated to the big groups starting in February 2015. Metrobus is also to take two Wright bodied B8RLEs for the FastTrack operation. ADL is also understood to be considering a B8RLE demonstrator for 2015. Of 1,703 Volvo hybrids so far ordered (a figure set to top 2,000 before the year end) 647 have been sold to the UK, though not all are yet delivered. As previously explained in B&CB (see issue 1260, 24 January 2014), Volvo’s bus strategy is based on a gradual change to electromobility and it is following its very successful hybrids with plug in electric hybrids which will in turn be joined by full electrics in 2017. Phil said that Volvo was thinking about what cities would need at some point in the future. Cities would face enormous EU fines if they did not clean up their air. This is an issue on which Volvo is doing a great deal of work: expect it to have lots more news to tell in the coming months.